At What Age Does a Pecan Tree Produce Nuts? What Is the Smallest Pecan Tree? What Is the Scientific Name for a Pecan Tree? How Long Does it Take a Pecan Tree to Grow? How Far Apart Should Pecan Trees Be Planted? Different pecan cultivars produce nuts at different ages. In Texas, where the pecan is the state tree, Caddo, Cheyenne and Wichita trees produce as early as 5 years. Western pecans take 7 to 8 years, and Desirable, 8 to 10. The Pawnee pecan tree is a dwarf that grows 30 feet in both height and width. The tree produces early and grows quickly. Its shell type nuts are large and plentiful. The tree is considered perfect for small gardens. The pecan tree, the tallest of the members of the hickory family of trees, has the scientific name Carya illinoensis. Native to the central part of the United States, the pecan can grow to heights of 140 feet in some cases. The average life span of a pecan tree is 150 to 200 years; however, this can vary greatly depending upon your geographical location. Pecan trees thrive in a warm climates (zones 6 to 9). This type of pecan tree grows primarily in the southeastern parts of the United States and other parts of the world. It takes about 10 years for them to produce pecans. These trees are sturdy, and the pecan nuts have thick shells with shapes that vary from oval to oblong. They are able to cross-pollinate with other trees. These pecan trees are indigenous to the North Carolina area of the same name--Cape Fear. They grow large and upright with deep roots, and the pecan nuts have thick shells and are shaped like ovals. This type of pecan tree is native to Mississippi, Florida and Georgia. 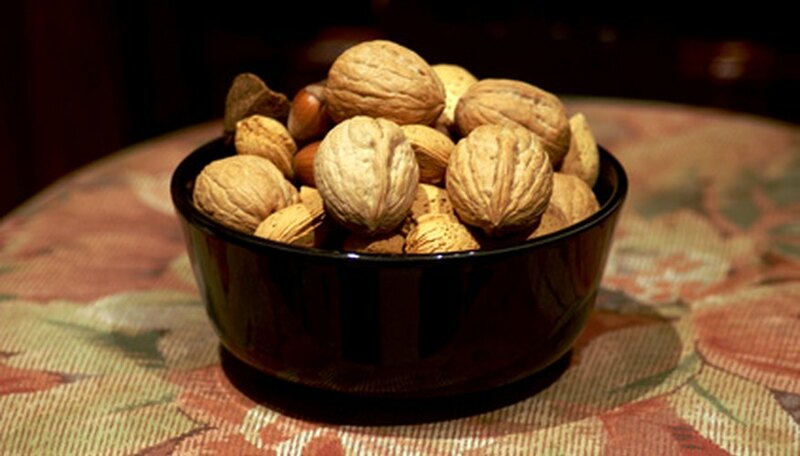 The nuts do not take long to produce, and they have thick bumpy shells that are quite large. They produce a large volume of pecan nuts during a lifetime and are good at pollinating with other pecan trees. This type began in Louisiana and flourishes in dense concentration, producing canopies and shade. The pecans are smaller with oblong-shaped shells, and the shells are fragile enough to be cracked without any tools. Purchase mixed fertilizer with 10-10-10 or 13-13-13 on the label. This fertilizer has equal portions of nitrogen, zinc and annonium sulfate and is vital to the health and fruit production of the pecan tree. Break up the soil at the base of the pecan tree. The soil should be easily workable by hand or with garden utensils, free of large clumps and easily sifted through your fingers. Spread the fertilizer around the base of the tree, using 1 lb. per age of the tree. A 3-year-old tree will require 3 lbs. of 10-10-10 or 13-13-13 fertilizer at its base. Water thoroughly and rework the fertilizer into the existing soil. Fertilizing your pecan tree should be done once a year on a regular schedule. 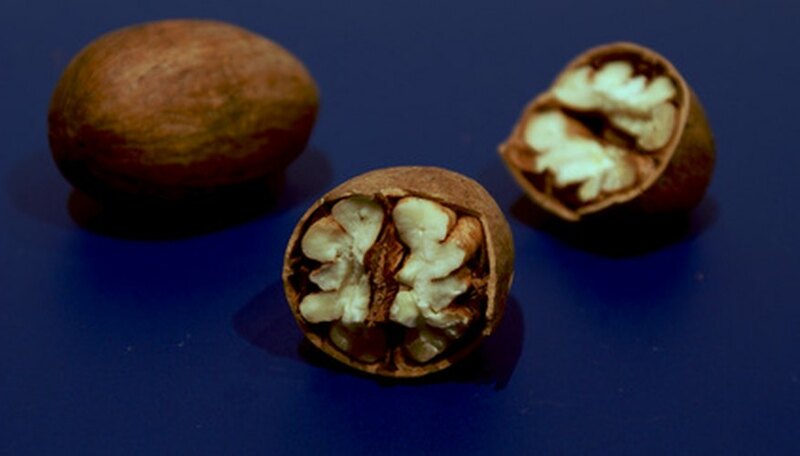 According to the North Carolina Pecan Growers, newer varieties of pecan trees bear fruit within five to six years, while older varieties take longer. Buy a dormant fruit spray from a nursery or garden store. Plan to apply it in the winter, before spring buds surface. Lay a tarp over nearby plants such as perennials and evergreens. This will keep them from getting damaged. Check with a local pest control company to see if you can rent a high-pressure sprayer. This will enable you to reach the tops of the trees better. Measure the amount of water and solution directed on the bottle instructions. Secure the lid and shake the bottle. Pump the nozzle to get the solution mixed. Apply the spray from the top of the tree to the bottom. Work your way along the branches. Pump the bottle periodically to strengthen the spray. Spray until the branches are soaking wet. Lastly, spray the trunk. Locate the tree's drip line, which is its outermost edge or the area where the tree’s longest branches extend. Dig a hole in the ground beneath the drip line 12 to 16 inches deep. Remove the lid from the lye. Lye is packaged in metal canisters, and the lid can be screwed off or popped off. Place the canister either on its side or upside down in the hole. Fill the hole up with soil. Pack down the soil down with your foot. Water the area thoroughly until fully saturated. Tree fungus damages the foliage and nuts on pecan trees. Some of the most common symptoms include infected nuts falling from the tree prematurely, white powdery growth on the leaves and swollen tumors on the tree's limbs, resulting in a tree lacking in vigor. Typical types of tree fungus include scab, powdery mildew, blotch, heart rot, rosette and crown gall. Certain fungal infections are more common in certain areas of the United States. For example, downy spot (Mycosphaerella caryigena) is cost commonly seen in Arkansas pecan trees in late June or early July. Most fungi occur during the last summer, when the conditions are the most humid. To prevent infections from occurring and spreading, anti-fungal treatments should be applied regularly throughout the growing season. For recommended local treatments, contact your county extension office. Each fungus has different symptoms, but in general anything that does not look normal on a tree is most likely an infection. For example, pecan scab (Cladosporium caryigenum) causes black spots on the leaves and stems of the tree and the nuts will fall off the tree early. Powdery mildew (Microsphaeria alni) creates an unattractive white powdery growth on the tree's leaves but will not actually harm the nuts. Most fungal infections will not kill the tree. Some fungus such as pecan scab (Cladosporium caryigenum) and internal breakdown (unknown fungus) will directly affect nut production. 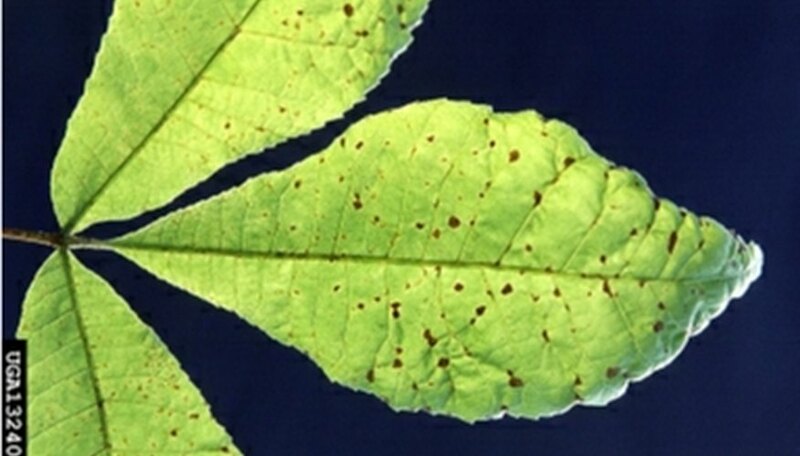 Diseases such as crown gall and downy spot (Mycosphaerella caryigena) affect the foliage and the tree's overall growth. The productivity of pecan trees depends on proper spacing. Plant young trees 30 to 40 feet apart. Once trees become overcrowded, it is necessary to space them further apart. Fully mature pecan trees ideally should have 50 to 70 feet between them. Select a live trap for capturing a squirrel that has a 9-inch-square opening at each end and is 24 inches long. Place the trap directly into the squirrel’s travel pathway. Set a bait of apple or orange slices, pecans or peanut butter from a loop about 6 inches off the ground so that the squirrel will smell it. Tie the trap doors open and leave them that way for a few days so that the squirrels can become used to feeding from the trap. Untie the doors and set the trap to be triggered when the squirrel attempts to remove the food from the loop. Check the trap twice daily until you have caught a squirrel. Release the squirrel at a location far away from your pecan orchard. Pecan nut casebearers position their larvae in small cocoons at the junction of the bud and stem. As the pecan buds open, the larvae migrate to the nut cluster to bore into the nuts. Pecan weevils emerge from the ground after a period of heavy rain. They infest the nuts and feed on the premature kernel, causing the kernel to shrivel. Pecan phylloxera is an aphid-like insect that feeds primarily on the foliage of the tree. Severe infestations cause weakened stems and will eventually destroy the entire limb. Twig girdlers affect young pecan trees. They lay their eggs onto the twigs which cause the twigs to become encircled by the larvae. In time, the infected twigs fall off of the tree. Yellow pecan aphids secrete a sticky substance on to the pecan leaves. The leaves soon become black with mold. Pecan scab is a fungus that spreads in warm and wet spring temperatures. Infected trees will experience premature nut drop and a decrease in nut size. Pecan trees produce nuts loved by people around the world; squirrels love them, too. Some huge pecan trees produce hundreds of pounds of the tasty treats. Like every other plant and tree, though, insects and disease cause problems for the orchard owner and backyard gardener. You can do certain things to prevent diseases. However, if it's too late and the disease is already present, it's important to start control immediately because waiting too long may cause the death of your beloved tree. Pecan trees are typically large. Older, established pecan trees can be 70 feet tall with a trunk diameter of 6 feet. The size of a pecan tree is influenced by factors including soil health, moisture and tree spacing. Dig a hole 3 feet deep and 2 feet wide for the baby pecan tree. Place the tree in the hole, spreading out the roots as you set it inside. Begin to fill the hole with water. Once the hole is half full of water, begin replacing the dirt. Turn the water off as it reaches the top of the hole and continue adding the dirt. As the water level decreases, keep adding dirt until it is level with the ground. Do not compress the dirt. Prune off half of the tree's height after planting. Pruning gives the plant enough time and energy to invest in its roots. Paint the trunk of the tree with a mixture of half latex paint and half water using a paint brush. Spread out a 6-inch layer of mulch around the base of the tree. Mulching aids in moisture retention. Water the tree, providing at least 10 gallons each week, at regular intervals. Collect pecan seeds during harvest season from October to November in order to be prepared to plant the seeds the following spring. Place the seeds in a dry environment and allow them to dry. To test the seeds to see if they are ready to move on to the next stage, try bending a kernel. If it snaps, it is ready. Place the seeds in poly bags in a refrigerator set to 45 degrees until the following spring. Remove the seeds and allow them to reach room temperature about 1 week before you wish to start planting. Soak the seeds in water for at least 24 hours prior to planting. Remove the nuts that have swelled and have slightly split for planting. Allow any remaining seeds to reach this stage by continued soaking before planting. Dig nursery rows to accommodate the seeds. Each space should be approximately four inches deep. Place the seed sideways in the hole. Allow the seed to receive sufficient water and sunline. The seedling will be approximately 6 to 18 inches tall by the following spring.